The third round of the 2014 eni FIM Superbike World Championship, which saw an overall attendance of 52,252 spectators, reached its climax today with the two races held in completely different weather conditions at the Assen TT circuit. After victory in the first encounter for Sylvain Guintoli (Aprilia Racing Team) – pictured above, Pata Honda’s Jonathan Rea came out on top in the rain-hampered, 10 lap Race 2 to secure his fifth WSBK win on his team’s home track. In the same race, Rea’s compatriot Alex Lowes (Voltcom Crescent Suzuki) scored his maiden podium finish in the series, a brilliant second place. Rea lies now fourth in the standings, only19 points shy of current leader and reigning Champion Tom Sykes (Kawasaki Racing Team), with Guintoli and the other KRT rider Loris Baz second and third, respectively. Jonathan Rea takes out Race 2. Michael van der Mark was Pata Honda’s other hero of the day, as the Dutchman won his career maiden World Supersport race in front of a vocal and enthusiast home crowd. Alex Lowes on the way to his first WSBK podium finish. 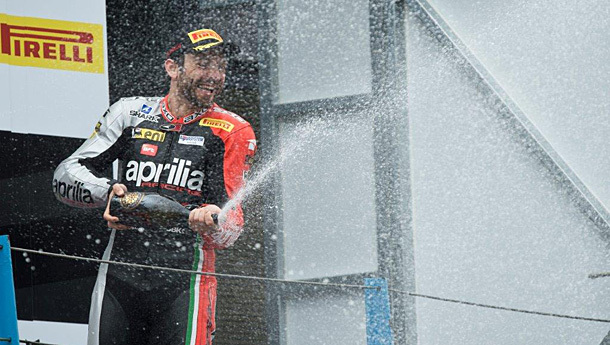 Assen (the Netherlands), Sunday 27 April 2014 – Sylvain Guintoli (Aprilia Racing Team) has taken victory in the first race of the day at a drying Assen circuit in the Netherlands. 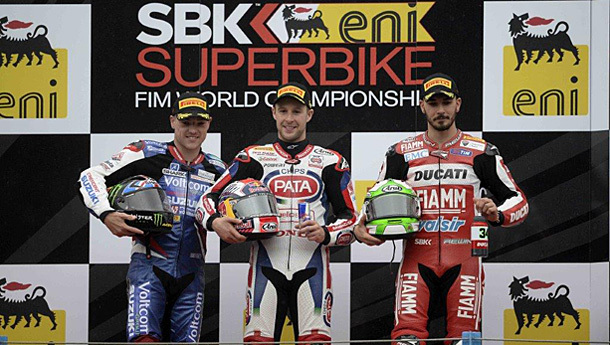 The 2013 WSBK runner up has climbed on the top step of the podium for the fifth time in his career, the second one this year after the win he scored at Phillip Island in Race 2. The race was classified dry and as the lights went out it was Guintoli who took the hole-shot with Jonathan Rea (Pata Honda World Superbike Team) and the Kawasaki Racing Team duo of Loris Baz and Tom Sykes giving chase. On the podium – Race 1 winner, Sylvain Guintoli. A red flag in the closing laps as Sykes was closing in on the leading Aprilia riders meant the result would stand with Rea finishing 3rd. Baz took 4th with Toni Elias (Red Devils Roma Aprilia) and Marco Melandri (Aprilia Racing Team) eventually classified 5th and 6th respectively a great race long battle. Niccolò Canepa (Althea Racing Ducati) finished a superb 10th position to end the race as the highest EVO category rider. Christian Iddon (Team Bimota Alstare), Eugene Laverty (Voltcom Crescent Suzuki), Davide Giugliano (Ducati Superbike Team) and Fabien Foret (Mahi Team India Kawasaki) all fell but should be able to take part in race two. Results: 1. Guintoli (Aprilia) 16 Laps/72.672 km in 25’56.636 average 168.067 kph; 2. Sykes (Kawasaki) 1.259; 3. Rea (Honda) 4.116; 4. Baz (Kawasaki) 4.459; 5. Elias (Aprilia) 23.728; 6. Melandri (Aprilia) 25.478; 7. Davies (Ducati) 26.533; 8. Haslam (Honda) 26.696; 9. Lowes (Suzuki) 27.971; 10. Canepa (Ducati) 33.479; 11. Scassa (Kawasaki) 40.689; 12. Salom (Kawasaki) 40.803; 13. Camier (BMW) 41.086; 14. Corti (MV Agusta) 41.410; 15. Guarnoni (Kawasaki) 41.977; 16. Morais (Kawasaki) 1’08.454; 17. Andreozzi (Kawasaki) 1’19.067; 18. Bos (Honda) 1’19.076; 19. May (EBR) 1’29.475; 20. Toth (BMW) 1 Lap; RT. Fabrizio (Kawasaki); RT. Laverty (Suzuki); RT. Yates (EBR); RT. Sebestyen (BMW); RT. Giugliano (Ducati); NS. Foret(Kawasaki); SH. Badovini (Bimota) 35.101; SH. Iddon (Bimota). 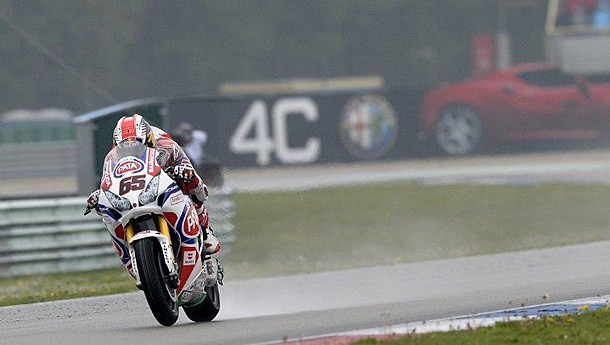 Assen (the Netherlands), Sunday 27 April 2014 – After a lengthy delay because of heavy rain and with conditions visibly better, compared to the situation that forced the Race Direction to red flag the initial race, the riders started a new race two over a race distance of ten laps. Eventually it was race one podium finisher Jonathan Rea (Pata Honda World Superbike Team) that emerged victorious ahead of Alex Lowes (Voltcom Crescent Suzuki) and Davide Giugliano (Ducati Racing Team) who completed the podium in tricky conditions. 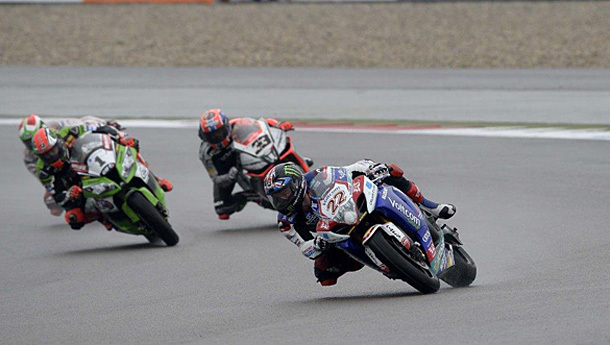 L-R Alex Lowes, Jonathan Rea and Davide Giugliano. Rea achieved the 12th WSBK race win of his career, the fifth one at the Assen TT Circuit, whilst Lowes scored his maiden podium finish in the series and Giugliano the first top 3 placement of his new adventure as factory Ducati rider. Tom Sykes (Kawasaki Racing Team), Leon Haslam (Pata Honda World Superbike) and Marco Melandri (Aprilia Racing Team) rounded out the top six. Sylvain Guintoli crashed at the chicane on lap two but was fortunate enough to be able to remount to salvage 9th at the flag, behind pole sitter Loris Baz (Kawasaki Racing Team), seventh, and Chaz Davies (Ducati Superbike Team), 8th. In the EVO class, Niccolo Canepa (Althea Racing Ducati) came home in 10th having the honour of being the first EVO classified rider in the race. Results: 1. Rea (Honda) 10 Laps/45.420 km in 19’09.464 average 142.251 kph; 2. Lowes (Suzuki) 2.222; 3. Giugliano (Ducati) 4.955; 4. Sykes (Kawasaki) 13.089; 5. Haslam (Honda) 13.639; 6. Melandri (Aprilia) 18.041; 7. Baz (Kawasaki) 21.837; 8. Davies (Ducati) 26.919; 9. Guintoli (Aprilia) 32.766; 10. Canepa (Ducati) 37.965; 11. Bos (Honda) 44.141; 12. Scassa (Kawasaki) 1’23.769; 13. Morais (Kawasaki) 1’45.062; 14. Fabrizio (Kawasaki) 1 Lap; 15. Salom (Kawasaki) 1 Lap; 16. Toth (BMW) 1 Lap; RT. Laverty (Suzuki); RT. Corti (MV Agusta); RT. Camier (BMW); RT. Andreozzi (Kawasaki); RT. Elias (Aprilia); RT. Foret (Kawasaki); RT. Guarnoni (Kawasaki); SH. Iddon (Bimota) 1’12.574; SH. Badovini (Bimota). Standings (Round 3 of 13): 1. Sykes 108; 2. Guintoli 96; 3. Baz 93; 4. Rea 89; 5. Melandri 69; 6. Giugliano 59; 7. Davies 47; 8. Laverty 46; 9. Haslam 44; 10. Lowes 36; 11. Elias 34; 12. Canepa 28; 13. Salom 27; 14. Scassa 11; 15. Camier 11; 16. Morais 10; 17. Foret 9; 18. Allerton 6; 19. Bos 5;20. Corti 5; 21. Guarnoni 5; 22. Fabrizio 2. Michael van der Mark (Pata Honda World Supersport Team) has won his first World Supersport race after an enthralling early fight with pole-sitter Florian Marino (Kawasaki Intermoto Ponyexpres). The Dutch rider had the packed grandstands on their feet as lap by lap he edged away claiming victory by over 9 seconds with the added bonus of a new lap record. Results: 1. Vd Mark (Honda) 18 Laps/81.756 km in 29’47.030 average 164.699 kph; 2. Marino (Kawasaki) 9.494; 3. Cluzel (MV Agusta) 14.988; 4. Coghlan(Yamaha) 17.131; 5. Zanetti (Honda) 17.430; 6. Rolfo (Kawasaki) 20.266; 7. Tamburini (Kawasaki) 20.662; 8. De Rosa (Honda) 21.370; 9. Jacobsen(Kawasaki) 23.557; 10. Wahr (Yamaha) 25.908; 11. Bussolotti (Honda) 26.051; 12. Leonov (MV Agusta) 27.815; 13. Wilairot (Honda) 30.450; 14. Russo(Honda) 39.705; 15. Menghi (Yamaha) 50.214; etc. Standings (Round 3 of 12): 1. Marino 49; 2. Vd Mark 45; 3. Coghlan 44; 4. Cluzel 41; 5. De Rosa 34; 6. Tamburini 29; 7. Sofuoglu 25; 8. Zanetti 24; 9. Rolfo 19; 10. Wahr 16; 11. Gamarino 13; 12. Leonov 12; 13. Russo 10; 14. Gowland 9; 15. Jacobsen 9; 16. Menghi 9; 17. Wilairot 9; 18. Bussolotti 7; 19. Kennedy 5; 20. Coveña 4; 21. Schmitter 3; 22. Calero 3; 23. Rogers 1. Manufacturers: 1. Honda 61; 2. Kawasaki 58; 3. MV Agusta 49; 4. Yamaha 44; 5. Triumph 9.